A fixed line is simply a rope that is anchored to the route and left in place. It allows safe, quick travel up and down a difficult stretch. Climbers protect themselves by tying into a mechanical ascender on the fixed line, eliminating the need for time-consuming belays. If you fall while climbing next to the fixed line, the ascender cam locks onto the line and holds the fall. It's also possible in some cases to climb a fixed line directly by hanging from slings attached to two ascenders and moving them methodically upward. However, fixed lines are not generally used for direct aid in the situations discussed in this chapter. The fixed line simplifies the movement of people and equipment, especially when numerous trips are required, and permits less-experienced climbers to follow a route. Fixed lines have been common on large expeditions to major peaks to provide protection on long stretches of exposed climbing or to protect porters while they make carries from camp to camp in the face of such obstacles as icefalls, glaciers, and steep rock or ice. The lines make it possible for climbers and porters to carry heavier loads than they could safely carry without them. Fixed lines are sometimes used as a siege tactic on difficult rock and ice faces, with climbers retreating down the lines each night to a base camp, then reascending the next day to push the route a little farther. They also come into play on continuous multiday aid climbs of big walls, where the second climber follows on the line, removing protection and hauling up equipment. The climbers do not retreat down this line, but move it upward as they go. Thus it becomes a "moving" fixed line, only one rope length long. Some climbers argue that fixing ropes is an outmoded technique, no longer required to climb any mountain or route. This is not the majority view, but the technique should not be abused. Fixed lines should not be used to supplement the climbing ability of an expedition team. If many of the climbers don't have the ability to climb a route without help from a fixed line, find an alternate route. Fixed lines should not be added on popular routes or in regions where they are not normally used. In the past, climbers often abandoned fixed lines when a climb was done. It was not uncommon to find several lines, one on top of the next, frozen into a route. This is no longer acceptable in a time of increasing environmental awareness, and each party needs to make a commitment to remove its fixed lines. To set up and use fixed lines, you need rope, anchors, and ascenders. Climbing ropes don't make good fixed lines because they are designed to stretch under a load, an undesirable characteristic in a fixed line. What you want is a more static rope, one with low elongation under load. Nylon is the most common material for fixed lines, though polypropylene and Dacron also are used. Kern-mantle construction is best, though braided ropes can be used. The diameter of fixed lines usually varies between 7 and 10 millimeters, with the size depending on the terrain and the amount of use the line is expected to get. Try to carry your fixed line in long lengths. The ropes are usually manufactured in lengths of somewhere between 300 and 1,000 feet, depending on rope diameter. To anchor the fixed line to the mountain, employ any attachment points that are normally used in belaying and climbing on rock or ice: pitons, chocks, natural outcrops, ice screws, pickets, and snow flukes or other deadman anchors. A mechanical ascender attached from your harness to the fixed line is the most efficient means of protecting you from a fall as you climb next to the line. Prusik knots can be dangerous because it is so time-consuming to untie and retie them as you move past an anchor, especially while wearing mittens. 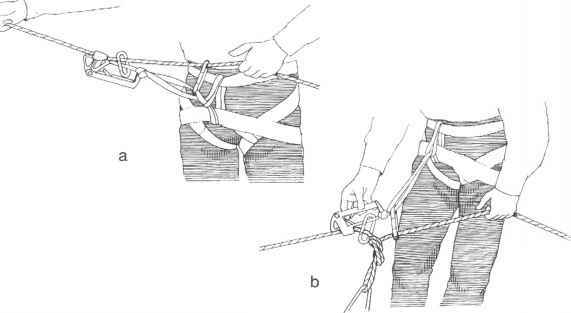 Prusiks are OK in an emergency or on very short sections of rope. Every fixed line needs an anchor at the bottom to hold the rope in place while climbers ascend, and a bombproof anchor at the top. Mark the location of the anchors with wands so you can find them after a snow storm. Place a series of intermediate anchors between the bottom and top of the fixed line. The fixed line is tied off at each anchor so that every section of line is independent of the others. This permits more than one climber at a time on the line. In deciding where to place the intermediate anchors, take several considerations into account. Place an anchor at points where you would like to change direction of the line or prevent pendulum falls. An anchor at the top of difficult sections of the route is helpful. If possible, place the intermediate anchors at natural resting spots, making it easier to stand and move the ascenders past the anchor. Always bury or cover snow and ice anchors and inspect them regularly for possible failure from creep or melting. Also keep a close eye on any rock anchors capable of creeping or loosening. Place anchors at locations that help keep the line from rubbing on rough or sharp surfaces, or pad the line at points of abrasion. Even small amounts of wear can multiply into dangerous weak spots on fixed lines, which usually use lightweight rope. Falls will also damage the line. After any fall on the line, inspect it for damage and check the anchors for any indications of possible failure. 1. The most common way is for two or three climbers to ascend the route—using a standard climbing rope to belay one another or to establish a running belay—and setting the fixed line as they climb. They can carry the whole spool of line with them and let it out as they ascend, tying it off at each intermediate anchor along the way. Or they can just pull the end of the line up with them as they ascend, clipping the line into each anchor with carabiners. Then after anchoring the top, they can go back down, tying off the line at each anchor as they go. In either case, it can be a big job. Carrying the spool of line is difficult, but so is pulling up on the end of the line and trying to overcome the tremendous friction that develops as it travels through carabiners and over the route. 2. The entire fixed line also can be set on descent. The material for the fixed line must first be carried to the top of the route, of course. Tie the line into a bombproof anchor at the top. Then rappel or downclimb to tie the line off at intermediate anchors. These anchors can be the ones that were placed on the earlier ascent of the route, although new ones can be added just for the fixed line. 3. You can also use the fixed line as your climbing rope at the same time you are setting it in place. Use the line just as you would a normal climbing rope, clipping it into anchors as you climb, belayed from below. At the top, tie the fixed line into a bombproof anchor, and then it is ready to be tied off at each intermediate anchor. The problem with this method is that fixed line is usually thinner and has less stretch than climbing ropes. If you fall, there's a bigger chance the line could break. Even if it holds, the limited stretch in the line would make for a hard fall. An additional drawback is that the friction on the line as you pull it up through more and more carabiners will probably limit the maximum length of the run. This method is best saved for short sections of fixed line or for instances where a standard climbing rope is being used as a fixed line. For the final tie-off of the fixed line at each intermediate anchor, use a clove hitch or figure-8 knot in the line. Tie a sling directly to the anchor and clip a figure-8 loop or clove hitch into a cara-biner attached to that sling (fig. l5-7a). Or better yet, minimize use of carabiners and have one less link in the system by retying the sling directly through the figure-8 loop (fig. 15-7b). climbing as usual, except that your harness is attached by a sling to the mechanical ascender on the line in case you fall (fig. 15-8). 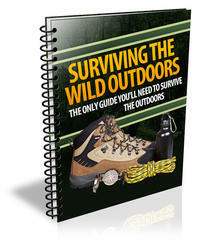 Start by tying a sling from the ascender to your seat harness where you normally tie in with the climbing rope. (A less desirable way is to clip the sling into a locking carabiner attached to the harness.) Make the sling short so the ascender won't be out of reach if you fall. If you're climbing a near-vertical section or have a heavy pack, you may want to pass the sling through your chest harness as well to prevent tipping upside down in a fall. Then attach the ascender to the fixed line, following the specific directions for your brand of ascender. The ascender should be oriented so that a fall will cause it to clamp the rope. It should slide easily up the line, but lock tight when pulled down. Test it before starting upward and also check the fittings on your seat harness. You should attach a carabiner from the ascender sling or a separate sling to the fixed line to serve as a safety link as you move upward. If you fall and the ascender fails, the safety carabiner will slide down the rope but stop at the next anchor below and arrest your fall. At each intermediate anchor, you have to remove the ascender from the fixed line and reattach it beyond the knot. This is the most dangerous moment in fixed-line travel, particularly if conditions are severe and you are exhausted. Be sure the safety carabiner stays on the line while the ascender is detached. Some ascenders can be configured so the safety carabiner can be moved and reattached above the anchor first, followed by the ascender. This order offers more security than moving the ascender first. Another safety option is to briefly clip yourself into the anchor as you relocate the ascender. Whatever your procedure, it's urgent that you think it through in advance and practice it on a good day so you can perform it reliably under the worst possible conditions. Fig. 15—8. Mechanical ascender attachment to fixed line: a, set up for normal movement; b, passing an anchor, move ascender separately from safety carabiner. any climber would not cause rope movement, rockfall, or other activity that could endanger anyone else. Climbing down with a fixed line is similar to climbing up. Again attach the ascender sling to your harness, then attach the ascender to the fixed line exactly the same as for ascending. Double-check that the ascender locks onto the rope when you pull down on it, and that it will be within reach if you end up hanging from it after a fall. Attach the safety carabiner. Begin your descent. As you climb downward, you will be moving the ascender down the rope to stay with you. Use a light grip on the ascender release so that you can let go of it instantly to permit the ascender to grab the rope if you fall. It's natural to try to hang onto something if you lose your balance, but the last thing you want to grab hold of at that moment is the ascender release. Take extreme care as you climb past anchors, removing and reattaching the ascender. As in climbing up, never detach the ascender and the safety carabiner at the same time. Again, you can temporarily clip into the anchor while you relocate the ascender. On steep sections of fixed line, rap-pelling the fixed line may be a good alternative to downclimbing. Exhausted mountaineers at the end of a grueling climb often find it easier to abandon gear, garbage, and fixed line to the mercies of the mountain. This kind of behavior has become less and less acceptable, and expeditions now are learning to approach their climbs with a commitment to removing all signs of their passage. Removing fixed lines will be easier if you keep it in mind as you plan where to put them up in the first place. In some cases you may be able to use a "moving" fixed line, removing it and moving it higher as you ascend the mountain, then descending via a safer route. If you are leaving the mountain and going down a fixed route for the last time, plan a downclimbing or rappelling procedure, or a combination of the two, that will permit the party to remove the fixed line. What applies to fixed line also applies to all the other odds and ends of the expedition. Everything that goes in has got to come back out. Crevasses can't be used as garbage dumps because between wind and hungry ravens, the contents can end up strewn up and down the glacier. You can set fire to burnable garbage, but haul the ashes out. For human waste, set up a group latrine at each camp. In an exception to the use of crevasses, you can line the latrine with plastic garbage bags and then dispose of the waste in a deep crevasse. How to attach to fixed lines mountaineering? How to set an anchor ascender? How to climb with fixed lines? 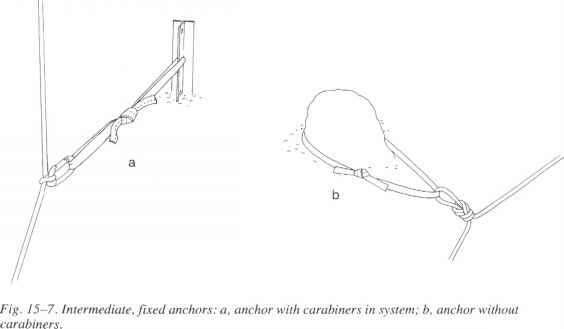 How to pass an anchor on a fixed line? How do we see fixed lines moving? HOW TO ASCEND FIXED LINES? Can you use ascenders to climb down? How to set fixed line climbing? How to attach mechanical ascender to harness? How to set fixed line mountain? How to set up fixed line mountaineering? How to descend a fixed linje using a mechanical ascender? How to accend fixed ropes mountaineering? 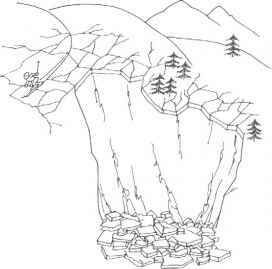 What is a ridge line and fixed line mountain climbing? How to place fixed lines climbing? How to use ascender ice fixed rope? Can you climb a rope with 2 line in the same carabiner? How did fixed rope make for mountain climber? How to make anchor for fix line? What is a fixed line clibm? Where to tie in the least experienced climber in rope team of three glacier climbers? How to open fix rope in mountain? How to tighten a rope between to fixed points? How to attach to mountain safety rope? How to set up a fixed.line for ascending? How to attache to a fix rope? How to establish fixed ropes? How to use fixed ropes alps? How to ascend fixed line? What is Mountaineering fix rock anchers? Do mountain climbers attach to a rope line?